Mr. Moynahan has written a passionate and moving book focusing on the role music played in this catastrophe. 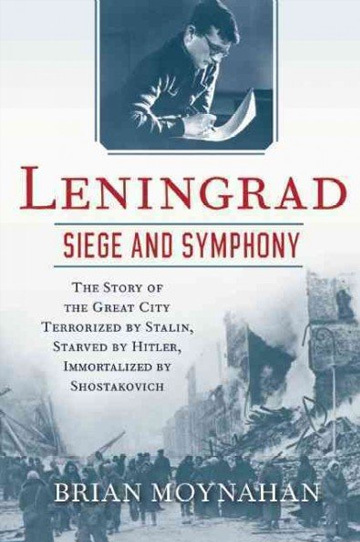 “Leningrad: Siege and Symphony” is filled with vivid details. German soldiers defiled Russia’s cultural heritage by occupying Tchaikovsky’s rural dacha, where they parked their motorcycles inside and burned a lovely gazebo for warmth. In the city, bombs and artillery shells—as many as 12,000 in a single day—destroyed not just homes and families but also priceless musical instruments. Although Leningrad residents continued to attend concerts, they shivered in winter attire rather than evening wear. Mittens and gloves muted their applause. As Shostakovich’s biographer Elizabeth Wilson has shown, Stalin terrorized the composer in a far more immediate way than Hitler. The purges of the 1930s eliminated artists as well as other bourgeois, and Shostakovich’s modern, inaccessible music made him an easy target. Recognizing his talent, the Communist Party commissioned his Second Symphony for the 10th anniversary of the October Revolution but harshly criticized his early forays into opera and ballet. Shostakovich received his first official denunciation in 1936, after Stalin walked out of a performance of his opera “Lady Macbeth of the Mtsensk District.” The next day’s review in Pravda attacked Shostakovich for “formalism” and warned that he was “playing a game” that “may end very badly.” The composer withdrew his Fourth Symphony as a result and curried favor by writing the patriotic Fifth, as well as the Sixth, which he dedicated to Lenin. The Seventh Symphony must be understood in this context. Shostakovich wrote it during a time of wartime mobilization, when the party needed cultural propaganda and briskly stamped out dissent. He was still trying to rehabilitate himself after the disaster of 1936. His progress on the new symphony was a very public undertaking, with Pravda regularly updating readers on his work. In media appearances, Shostakovich asserted a love for his native city and a willingness to do his bit for Russia. He dutifully attacked fascism. But while Mr. Moynahan ably presents the composer’s wartime years, he elides a critical question: whether the Seventh was propaganda that Shostakovich willingly produced in order to get Stalin off his back. He had done so before. Today the Fifth Symphony is widely viewed as a conciliatory gesture toward the party. It digests easily, contains passages that are militaristic and upbeat, and ends resolutely in a major key. The Seventh has some of the same characteristics. It is tuneful, repetitive and accessible. With the first movement’s droning snare drum signifying the German onslaught, the hummable melody and the pep-rally finale, the Seventh appears far too programmatic and one-dimensional for a man who would go on to write the anguished and complex Eighth and 10th symphonies, not to mention the deeply unsettled string quartets. The Seventh was a suitable offering for a fighting nation in need of a boost—the Russian equivalent of a war-bonds poster. On some level it probably represented Shostakovich’s genuine response to seeing his city dying—especially the adagio movement. But given what we know about the composer’s difficulties with the regime, questions about the Seventh Symphony’s purpose and provenance do affect our understanding of the music’s role in the Leningrad siege. They inject a measure of doubt and uncertainty into a situation where moral clarity was enforced at the point of a gun.